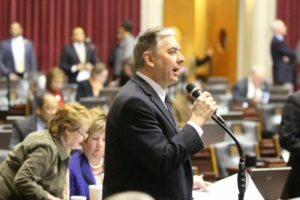 Missouri House Recognizes Importance of Sheltered Workshops - Canterbury Enterprises Inc.
House Bill 4622 passed its final hurdle in the House by a vote of 142-0. Click here for an article in the Missouri Times last week following the Bill being perfected. We are hoping to get the bill passed by the Senate prior to the end of the Session. As you may remember, many employees with disabilities, staff, family, friends, and supporters of workshops from around the state, including Canterbury Enterprises, visited the capital to share their experiences, advocate for self-determination, and create awareness for the positive impact sheltered workshops and the choice to work in one has made for people with disabilities. Below is the press release for that event. St. Louis, MO / Jefferson City, MO – April 24, 2018 is being recognized nationwide as “A Day for Choice” advocating for employment choices for adults with disabilities. In Missouri, this effort has been spearheaded by a group of individuals with disabilities, their parents, caregivers and coworkers, known as A Team Missouri. They will be joined by MESA (Missouri Employment Supports and Advocacy). This group will gather in Jefferson City on the third floor of the rotunda in the Capital Building at 9:00 a.m. on April 24th to raise awareness for their mission and voice their concerns with state legislators. Hundreds are expected from all over the state to attend this showing of support. A Team Missouri officially formed in 2016 and quickly grew statewide. Through their campaign, “Dignity Has a Voice”, the group successfully lobbied for nearly unanimous passage of state legislation in 2017 to maintain choices for both community and sheltered employment. A Team Missouri’s efforts did not go unnoticed, with similar groups across the country following suit to organize movements in their own states, spawning the creation of A Day for Choice, when groups nationwide will be showing up to be heard at their state capitals. The ability to maintain and develop expanding employment choices for individuals with disabilities is facing serious threats in a political climate where legislation is being presented based on a lack of education and understanding of the unique needs of this population. A Team Missouri believes it is important to offer choices for both community-based jobs and employment in sheltered workshop environments, an option some are attempting to remove from the table under the guise of advocating for those with disabilities. There are 89 sheltered workshops across Missouri, employing approx., 6,000 individuals. 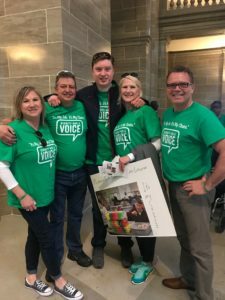 A Team Missouri and Dignity Has a Voice invites concerned citizens to join them at the Missouri State Capital for A Day for Choice on April 24th and follow the movement at DignityHasAVoice.com and on Facebook at @DignityHasAVoice. Local leaders, legislators and representatives are encouraged to tour workshops in their area to see the benefits for themselves and gain a better understanding to make informed decisions on these matters. A list of workshops statewide can be found on The Missouri Department of Elementary and Secondary Education website here (link: https://dese.mo.gov/sites/default/files/se-sw-TFSMap.pdf). MEDIA NOTE: A Team Missouri members, including adults with disabilities, family members, and organizational leaders are available for media interviews via contact Tracy Gritsenko below.